Snow white lives in Salem, Massachusetts with her dad, stepmother, and her cat, Gatsby. Her entire life she's been teased for her fairy tale name, and the fact that her seven best friends happen to be guys whose names begin with the same letters as the seven dwarves. Blood and Snow starts with the instantaneous lure with charmingly dynamic characters. 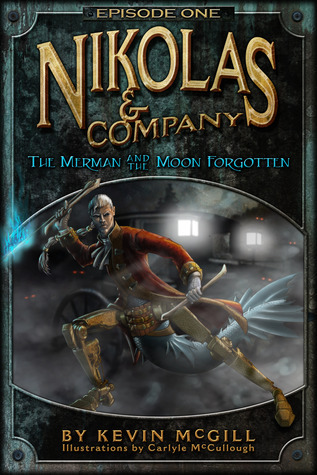 The story is fun, smart, and romantic. Just the way I like it. I enjoyed Workman's writing style and our heroine's bestfriend-voice feel. Great job! There are certain parts that felt a bit inconsistent to me: the house next door to Snow is a mansion on a huge piece of land while hers is small--unless they're out in the country, but I didn't get that feel; her parents are away at St. Barts while their home has mismatched furniture as if they live on a low income. Being a novellette, there are a few elements (hottie Chace for example) that were covered only once, but since it's part of an ongoing series, I have that to look forward to hook me further. Kudos to the author! 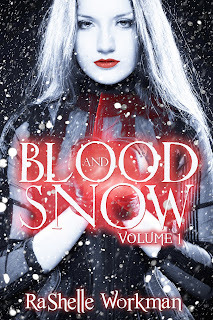 I'm excited to read more of the Blood and Snow series! Purchase Blood and Snow here! Let me share with you some crazy things that have been going on. First, I've lost sight of why I started to blog. It became a task as I scrambled my brain, trying to think of things I think you'd like to see. I started comparing myself to the great Elana Johnson and how full of useful writerly and authorly info is always packed on there. I tried to keep up with her by posting like stuff, but it soon wore me. How destructive is it for me to compare myself? I've taken workshops on how to be an effective writer and how to make my blog appealing to readers. I soon felt inadequate and unworthy (yes, silly to say, but true) to continue posting at all. Guess what? I was trying way too hard and becoming something I was not. Being a published author has done some crazy things to my brain. I no longer think of my blog as my personal backyard, but as a place I must appear gracious, graceful, and polite but also as a pubic relations representing yours truly. I've most certainly lost sight of myself here on the web. These wild ideas have taken me far offshore from where I want to be. My lack of confidence has created a huge mental block that tells me "I can't." I literally feel blinded from being able to function as I once had before I was published, and it always leaves me feel for wanting and always lacking. I want to have fun and make it simple, heart-felt, and helpful. Where have I gone wrong? The FBI promises Jacinta Rivera and her friends that they are safe. Jaci wants desperately to believe them but weeks of hiding from their kidnapper, alias "The Hand", have left her wary. Hidden from the public eye in an FBI safe house, Jaci must reconcile both her father's mysterious disappearance and the murder of her best friend. A betrayal lands Jaci back in the grasp of The Hand, shattering her ability to trust, and leaving her to wonder if she will ever piece together her broken life. 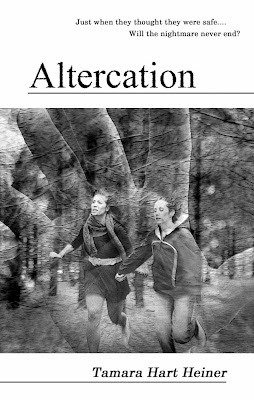 The sequel, Altercation, became just as dangerously scary as its counterpart, Perilous. With the criminals at large, I can't blame our heroine, Jacinta, from holding onto her fear as she struggles to trust the FBI--or anyone for that matter. There are so many twists and turns, I didn't see things come up that had me wonder what would happen next and how the girls would squeeze out of certain conundrums. It ended nicely, I'd love to see how Heiner plans to continue Jaci's journey to healing from such a tragedy! Guess what? Tamara Hart Heiner is holding a contest! Every day she will select a single person from a Blog Tour Participant's blog comments on the day of posting. The winner (chosen at random) will either get an ecopy of Perilous or Altercation. There must be at least 10 comments under the post in order to generate enough numbers for winning! +1 for ever Tweet or Facebook mention of this tour. NOTE: You can either add every point you've done and send it to the author, or include her twitter name (@tamaraheiner) and/or Facebook (Tamara Hart Heiner) so she could tally it up for you! Please be sure to leave a COMMENT in order to enter to win!